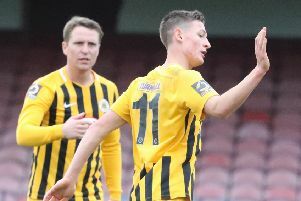 John McCombe has had his Boston United contract cancelled. The 33-year-old defender, who joined the club in the summer, has left the Jakemans Stadium by mutual consent after failing to force his way into Craig Elliott’s team. Meanwhile, keeper Dylan Parkin has joined Evo-Stik Division One East side Cleethorpes Town on a two-month loan deal. Although he can be recalled by the Pilgrims, he is expected to remain with Clee until October 6.